PRICE REDUCED!! I Am Selling My Complete Digital T-shirt Business!! FOR SALE IS A COMPLETE DIGITAL PRINTING T-SHIRT BUSINESS!!! SALE INCLUDES EVERYTHING YOU WILL NEED TO START YOUR OWN T-SHIRT BUSINESS RIGHT AWAY!! START MAKING MONEY IMMEDIATELY!! **Also comes with: White Ink Kit, DTG Inks, Pre-Treat, (2) Wagner HLVP Pre-Treat Sprayers, Cleaning Solution, DTG Manual, Design and Drivers CD, USB Cable, dozens of white & black tees & many EXTRAS!!! The HM1 features head-moving technology for even crisper prints and higher production rates. The DTG HM1 features all the characteristics that made the original DTG Kiosk the world's first choice in digital direct garment printing, but with some added user friendly SMART features to enhance speed and print quality. 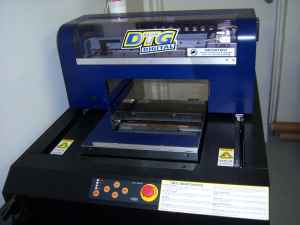 Perfect for textile direct printing and rigid surfaces, the DTG HM1 sets a new standard in small flatbed printing technology. With an 8 color bulk ink system built-in and auto bed adjustment to a max 5.5 in. All with advanced firmware options to provide the industry's most reliable and accurate garment printing solution. Whether you're printing textiles or rigid surfaces, the all new DTG HM1 is loaded with features creating a perfect platform for your business. It costs less than 30 cents for a full size 11.5" x 15.5" print that takes only minutes to make and much less for smaller prints. You'll be amazed at the quality and ease of use - not to mention the speed, all from a range of specialty designed inkjet printing systems. CorelDRAW, Adobe Illustrator, Photoshop, QuarkXpress, your favorite sign program and even Word files are downloaded directly to the printer for superior prints time after time. At an average selling price of $15 per shirt and direct material cost of $2.00 per shirt, the gross margin is in the range of $13.00 per shirt. 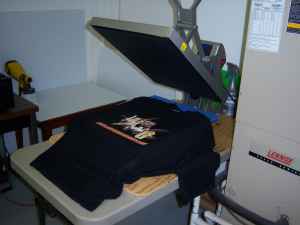 Adjusting for other costs such as labor and equipment financing, let’s adjust the profit to $10.00 per shirt. The printer will pay for itself when you sell about 1,400 shirts. 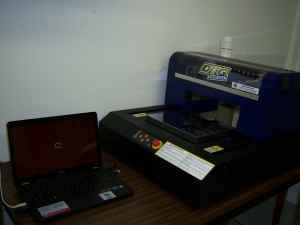 The printer is capable of printing more than 4,000 shirts per month. The key to financial success is operator's ability to sell the shirts and printing services. Re: I Am Selling My Complete Digital T-shirt Business!! who we are, the one make the world colorful.